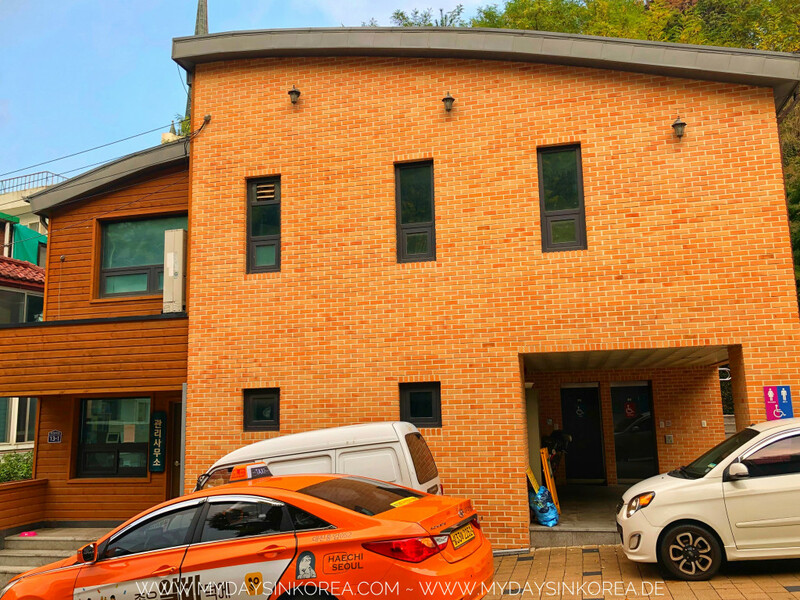 More information online: visitseoul.net (Eng), cafe.naver.com (Kr) or naver.blog (Kr). On the way from the main road to the park, you will find some convini, from which you can buy some food and drinks for your stay. Once you reach the end of the road, you will immediately see the wall. 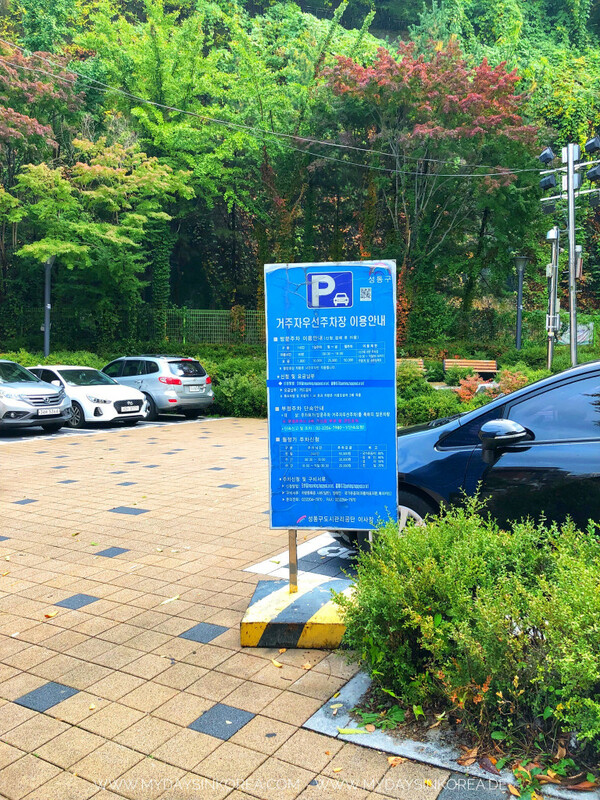 A small parking lot is also available there. On the left side, the management office and toilette are available. 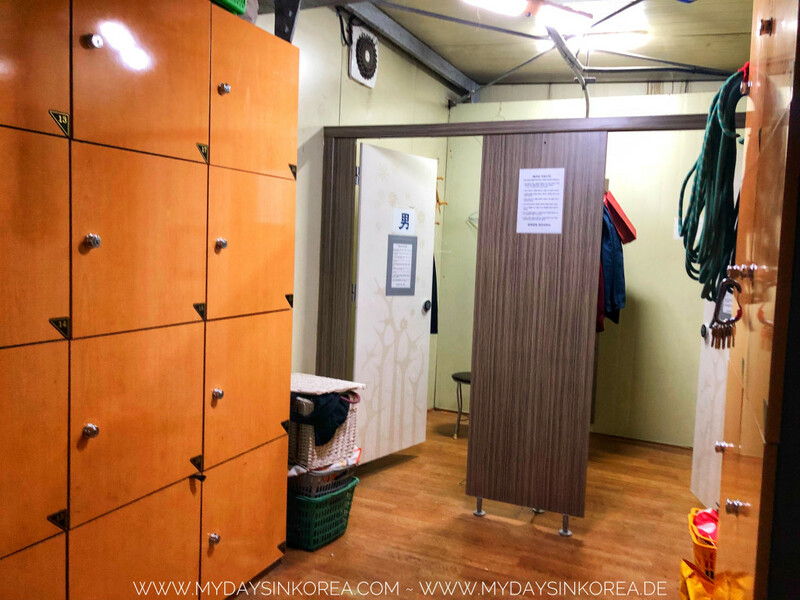 Around the walls, you will find some fitness devices, benches and pavilion to rest in the shade, as well as a lot of space to spread out your gear. 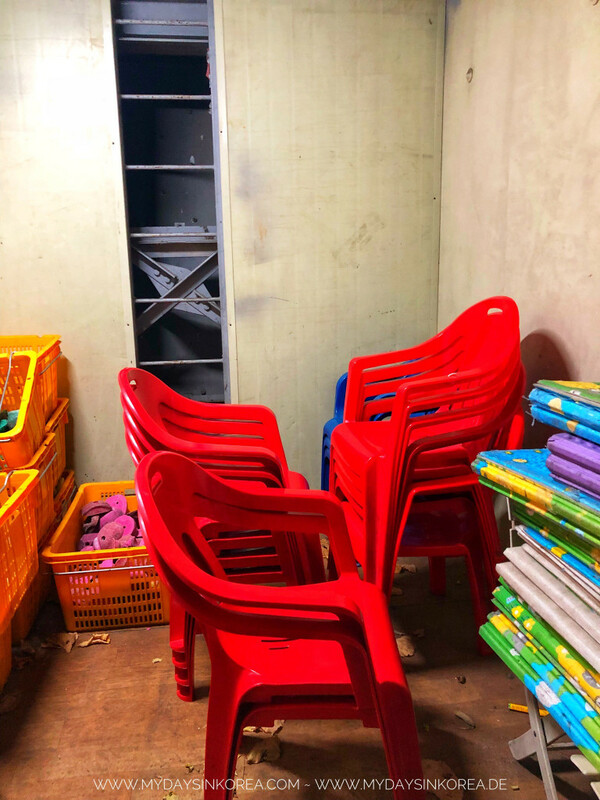 You may not tell at the beginning, but there is a changing room with lockers and a storage room with chairs and sitting mats that you can simply use for free of charge. If I read correctly, there should be also some indoor training area that can be used upon request. Please contact the management office for that. Unfortunately they can only speak a little English. Maybe the Translation app could help in this case. 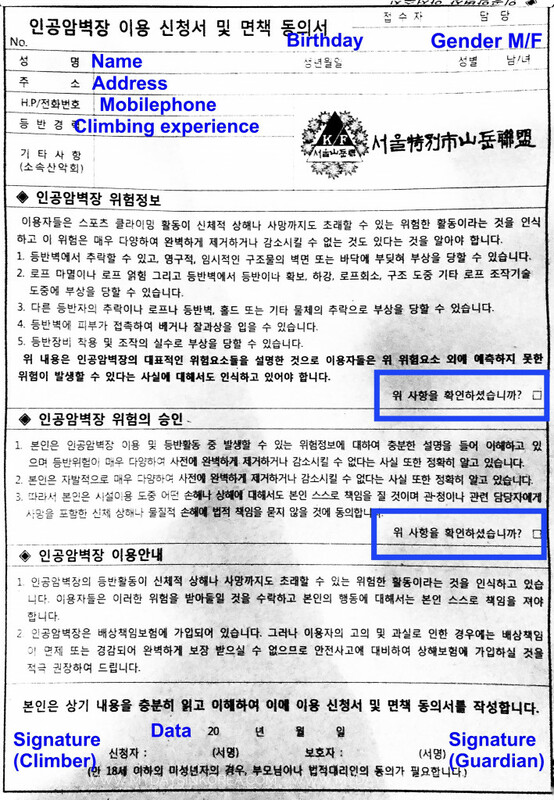 You need to sign the Terms and Conditions for usage and fill the participants’ list before start climbing. These two are only available in Korean, so I have made a translation with the most important information for you below. Actually, the terms and conditions are similar to the one you have to sign everywhere. They include such terms as, you are allowed to climb and belay only when you can; pay attention when climbing; be aware of all the risks, etc.. I could also see some headlights around the climbing area that allow you to climb by dark. So, since everything is really good maintained and all for free, I had no other choice than to give ⭐️⭐️⭐️⭐️⭐️ for the facility. How is the rock wall? Obviously this park has been opened for climbing since 1999. 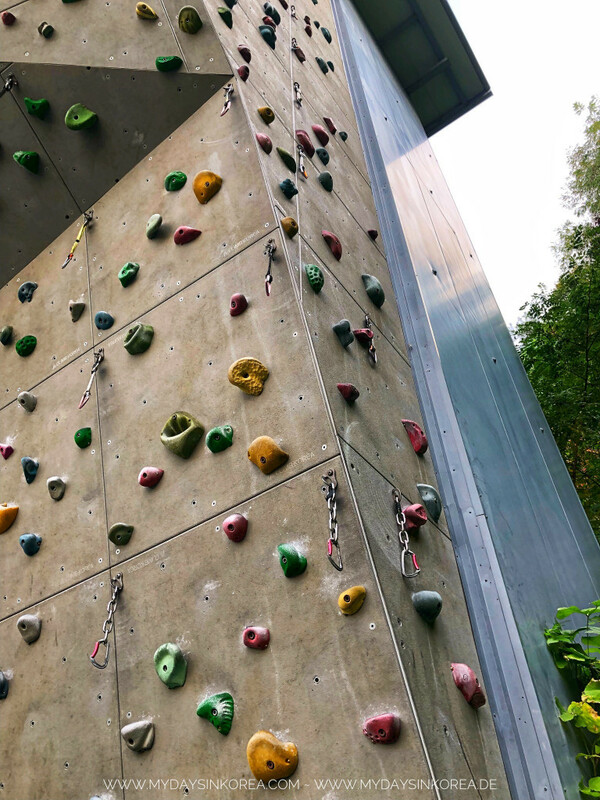 As you can see in the first photo, there are two big climbing walls, each about 15m high. On the right side is the one with some top rope routs for courses and speed climbing. Usage is only possible on request. All routes look like they’ve never been used before. And the main lead wall, which is much wider, is on the left side. Around 50 routes for lead climbing were set on this wall. All of them are well secured, seem to be new, but challenging. Unfortunately the difficulties of the challenges are not written anywhere. I talked to some of the Korean rock climbers in the park. They said there are routes between 5.8 (6-) and 5.13a (9+) and could tell me the difficulty of some, but not all. That means, you have to ask others, who know the wall, or climb to find out, how difficult the routes are. 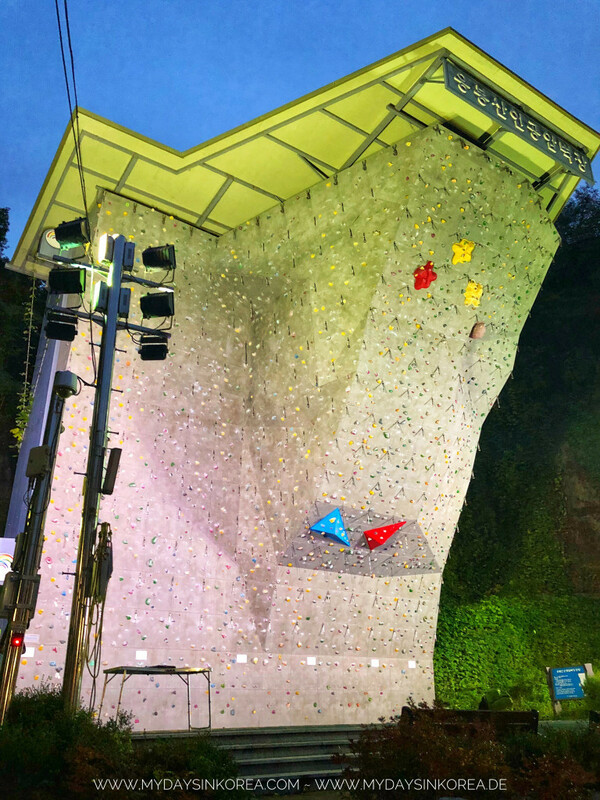 I came to Engbongsan Rock Park on a Thursday evening for climbing, when it already got dark. Since my climbing partner Danny came later than me, I had time to look around. I saw a group of Korean rock climbers on the yard. They chatted, laughed and made jokes with each other. No one was climbing. After a while, some people left. Only a couple stayed, got to the wall and got ready to climb. Suddenly they noticed me standing around and a lady asked in Korean what I wanted to do. 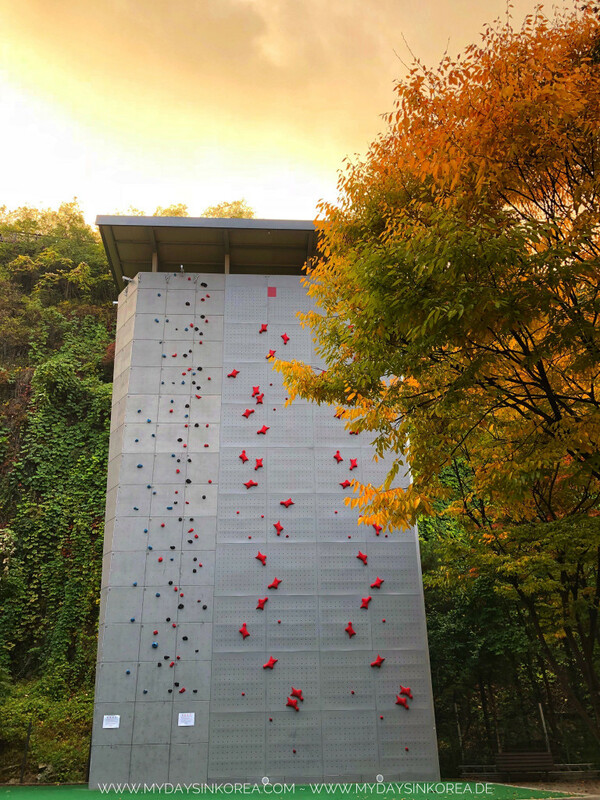 I tried to explain them with my few Korean words, that I wanted to climb too, but was still waiting for my climbing friend. The lady implied, whether I wanted to climb with them. And when I said yes, she told another guy, who was actually finished climbing to come and belay me. Very quickly, he came with his harness, belay device and gloves, to send me up to the wall! Thanks to them, I could climb some routes before Danny came. The couple was climbing next to me, somewhere in the middle of the lead wall and had fun. We also chatted in between during the break, mainly using the translation app. 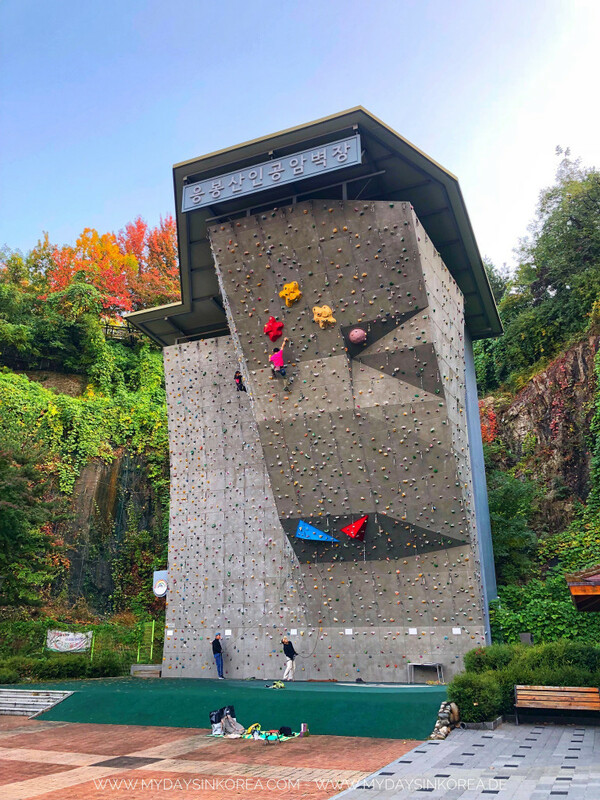 We introduced ourselves, talked about climbing, I could ask them more about the Korean style of climbing and further facilities. I felt really warmly welcome! 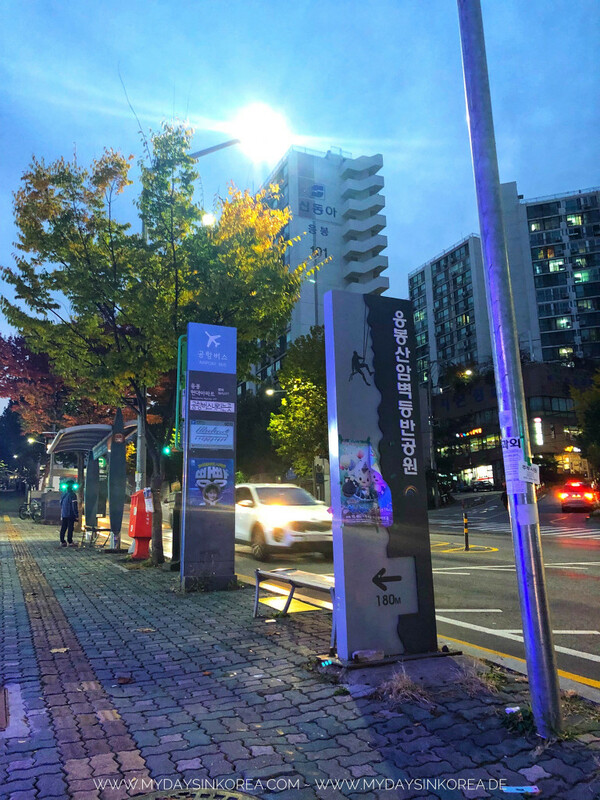 The route setting in Korea is so challenging, because there is no foot holds, as Ashley also mentioned on her blog Wandering Seoul. That means, you often have to put your foot very high and twist, and use more force. So far, all climbing routes here and at the Dyno-wall seem to be more difficult than the grade says. 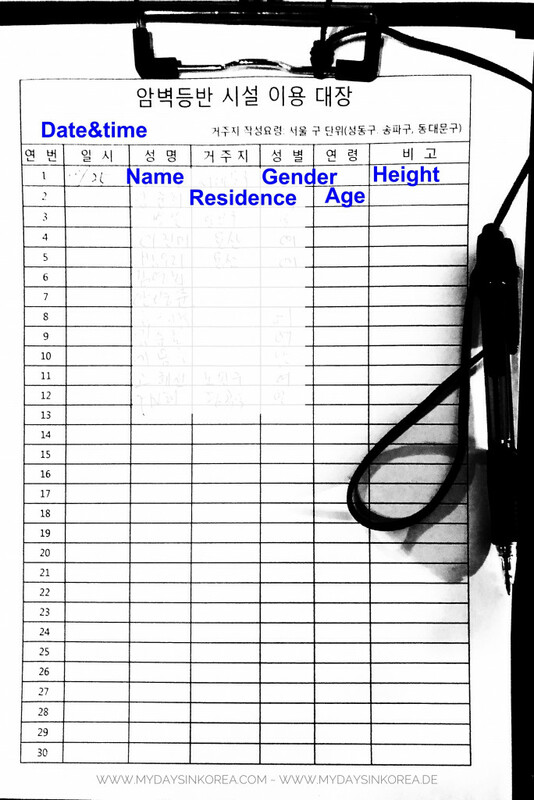 Or I am too short for the Korean route setting?! No way… just need more practice to get used to it! Sometime later Danny arrived. He came late because of the heavy traffic jam, and also because Kakao map sent him to the wrong location. So, please use Naver Map Link to navigate to the right spot. Such a fun climbing evening with many positive experience and motivation to go climbing more often! Price: ⭐️⭐️⭐️⭐️⭐️ – it’s free!